The innovative design of the new sub-meter meets strong customer demands for usability and universal applicability. 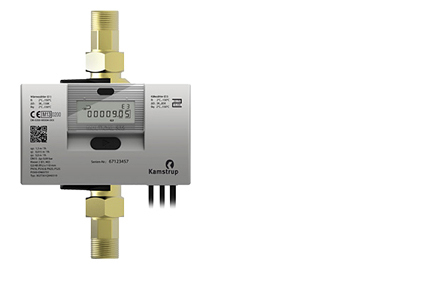 The newest energy meter in the MULTICAL®-series, the MULTICAL® 302, is Kamstrup’s first dedicated sub-meter for heat and cooling installations, and according to Kamstrup’s Product Group Manager, Søren Lang, it has been carefully designed to meet the most important needs for the people who are actually working with and relying on sub-meters. “We have been listening closely to the market demands and to our customers regarding what are the most wanted features in a sub-meter, and the result is a unique design built on a well-known standard technology platform targeted to make life easier for installers, property managers, building project managers as well as for billing companies,” explains Søren Lang, who has more than 20 years experience in developing advanced energy meters. The extremely compact dimensions of the new sub-meter, which needs only 59mm of installation radius, allow it to fit into the notoriously narrow spaces for sub-metering installations. Furthermore the sub-meter has a circular profile, which enables it to rotate into the optimum viewing angle, even when the meter is mounted at floor or ceiling level, and still fit into the narrowest installation. For more information on the Multical 302, please click here.